They’re red, yellow, white, or orange. They’re rectangles, octagons, or crosses. They have domes or spires; round, arched, or square windows; brick, marble, or limestone facades. Despite record low attendance from worshippers, these beautiful buildings show no sign of desuetude and still attract large numbers of visitors who are drawn not only to their religious aspects and architectural grandeur, but also to their secular histories, from funerals for knights to royal coronations. These are my favorites. 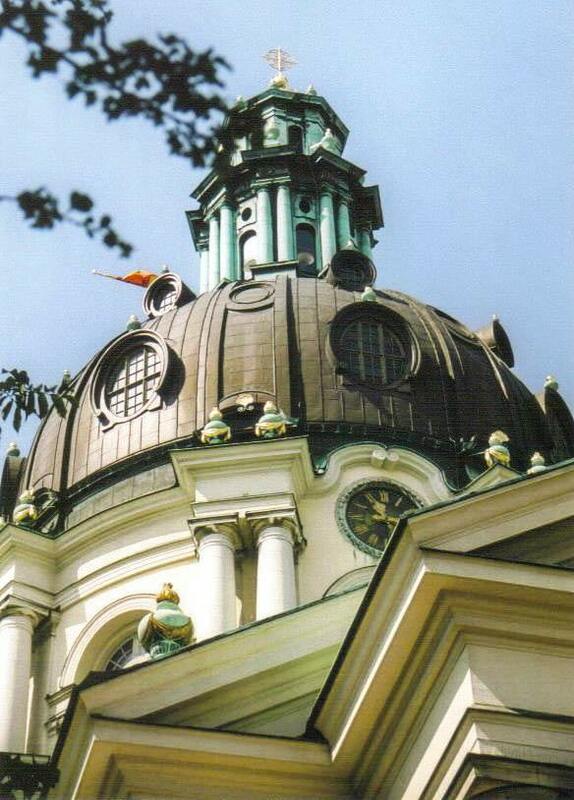 The beautiful dome of Gustaf Vasa Church looks as if it’s almost as high as the main part of the strikingly white church itself. Punctured with lots of oval windows and topped by a verdigris green lantern, this 200-foot dome grabbed my attention and never let go. Completed in 1906 in the Italian Baroque style and named after the 16th-century Swedish king, the church and its grounds occupy an entire city block, allowing for 360-degree viewing opportunities. Inside, the Greek cross floor plan accommodates seating for about 1,200 people, but I was largely by myself as I took a seat and looked around — and up — at this restrained Baroque beauty. A mural representing the Transfiguration of Jesus adorns the interior of the dome; the Four Evangelists are painted into the pendentives, with sculptures of their names and pairs of angels beneath them. There’s a terrific marble pulpit and gilded organ, but the altarpiece retains pride of place as the most arresting feature. Designed and built by a Swedish-German furniture maker and sculptor, the 49-foot-high altarpiece was created for Uppsala Cathedral in 1731, but after being removed from there and stowed in a museum, it found its way here and remains Sweden’s largest baroque sculpture. Oscar’s Church, also named for a royal (King Oscar II), has approximately the same age (built in 1903) and capacity (about 1,200) as Gustaf Vasa Church, but that’s where the similarities end. 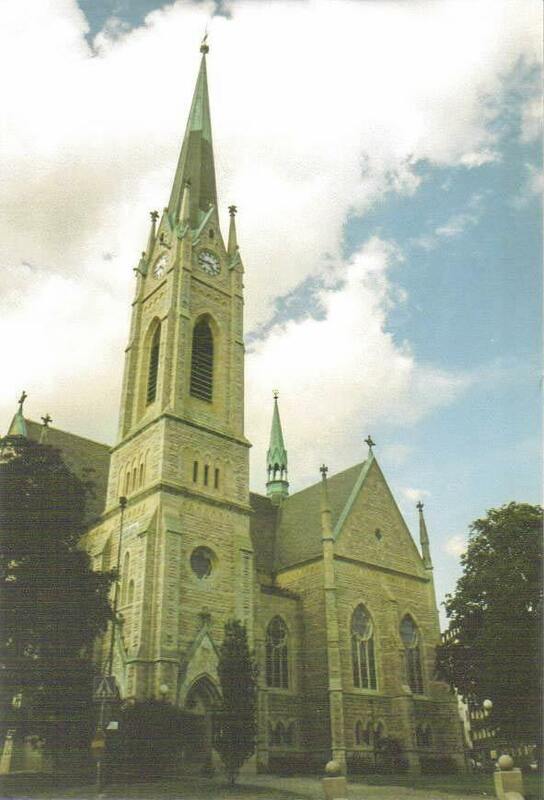 This asymetrical Gothic Revival church sports a soaring 260-foot tower with gargoyles and four clock faces. Clad in limestone and marble, the façade is an appealing hodgepodge of a rose window, multiple spires, and an abundance of pinnacles. Inside, two side aisles are accessed under brick arches, with seating galleries above. Stately brick ribs accent the plain vaulted ceiling. The organ, added in 1949, contains more than 5,200 pipes, making it one of the largest in Sweden. Exceptionally vibrant stained-glass windows added in 1923 remain the church’s highlight. Created by Emanuel Vigeland (whose brother Gustav beautified Oslo, Norway, with his Vigeland Park), who was inspired by medieval glass painting in Italian and French cathedrals, these 33 windows of Biblical subjects remain the most significant set in the entire country. Locals refer to Stockholm Cathedral as “the Great Church,” and after visiting it, you might just do the same. The oldest church in Stockholm, dedicated to St. Nicholas, traces its origins back to 1279, but expansions over the centuries lend themselves to the current late-Gothic character. Hemmed in on three sides by other buildings and narrow streets, the church is best appreciated from the wide open square behind it, where the orange façade reminded me of a tempting Creamsicle. Inside, the beautiful brickwork in the columns, arches, and ceiling impressed me. The ornate pulpit, with a detailed sounding board and a relief that depicts the story of the Canaanite woman, is outshone by the over-the-top Royal Pews. On either side of the central aisle, the two enclosed marble boxes are topped with a huge royal crown acting as a canopy and being supported by genii, and are backed by a billowing fabric that makes marble seem fluid. The church also boasts important pieces of art: Saint George and the Dragon, a carved-oak sculpture from 1489 that serves double duty as a reliquary, containing relics of St. George and half a dozen other saints; the “Silver Altar,” a wooden triptych with an ebony veneer and silver sculptured reliefs; an oil painting of a terrifying portrayal of hell; and a 1632 copy of The Sun Dog Painting, the oldest surviving image of Stockholm, depicting the medieval city and its environs under a halo display, an atmospheric optical phenomenon that appeared over the city in 1535. Given its age, the cathedral has seen its fair share of historic moments, including coronations and royal funerals, and it still remains relevant — the king and queen’s eldest daughter was married here in 2010. 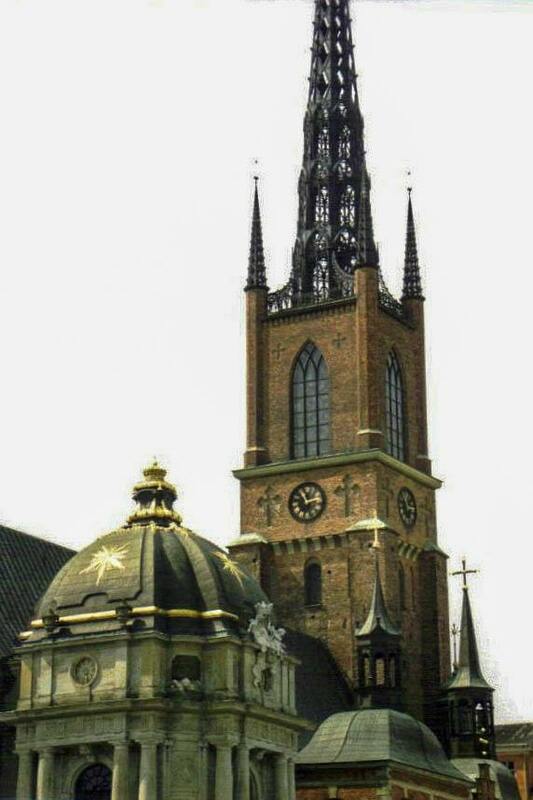 Rivaling Stockholm Cathedral in age, Riddarholm Church is one of the city’s most historic churches. Originally a greyfriars monastery when constructed in the late 13th century, the church has expanded over the centuries and was transformed into a Protestant church after the Reformation. The congregation was eventually dissolved in 1807. Today, the only services held here are commemorative events and burials, including those for every Swedish monarch from 1632 through 1950 — with the exception of the rather rebellious Queen Christina, who ended up in Rome. I viewed their mausoleums — some plain, some lifelike effigies — and tread on some of their grave slabs as I wandered around the three naves. Lower walls are laden with the shields of royal family members and knights, the latter of whom are honored with three hours of bell ringing when their funeral takes place. Back outside, I admired the mostly brick façade that features the very discernible side chapels, but my favorite part required me to look way up at the tower. Each of the four sides contains a clock, flanked by two plain crosses created by the absence of brick. After the church’s original spire was destroyed by a lightning strike in 1835, the current one was added — an open arrangement of cast-iron latticework that remains one of the most recognizable elements of the Stockholm skyline. 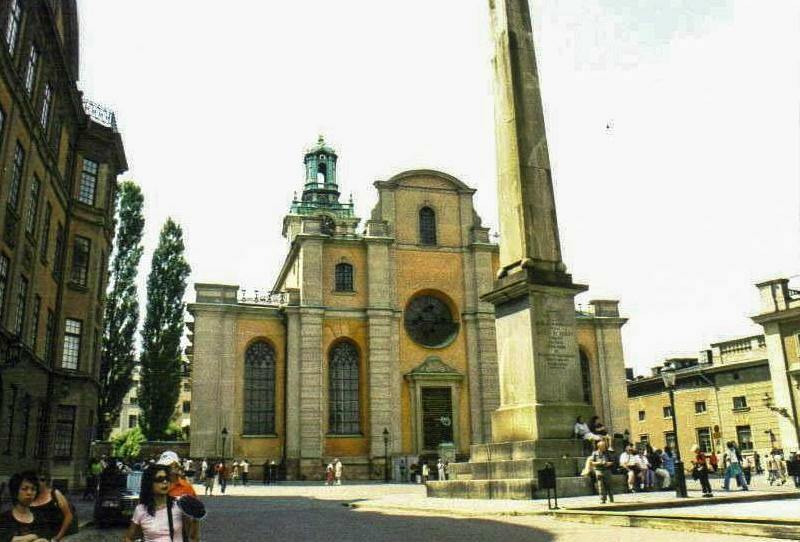 Popular for weddings, christenings, funerals, and concerts, Hedvig Eleonora Church stands proudly in the Östermalm district of Stockholm. Surrounded by well-trimmed grounds with benches, this octagonal church sports both a beautiful dome topped by a lantern with clocks and a deep yellow façade that I found especially pretty and cheerful on snowy winter days. 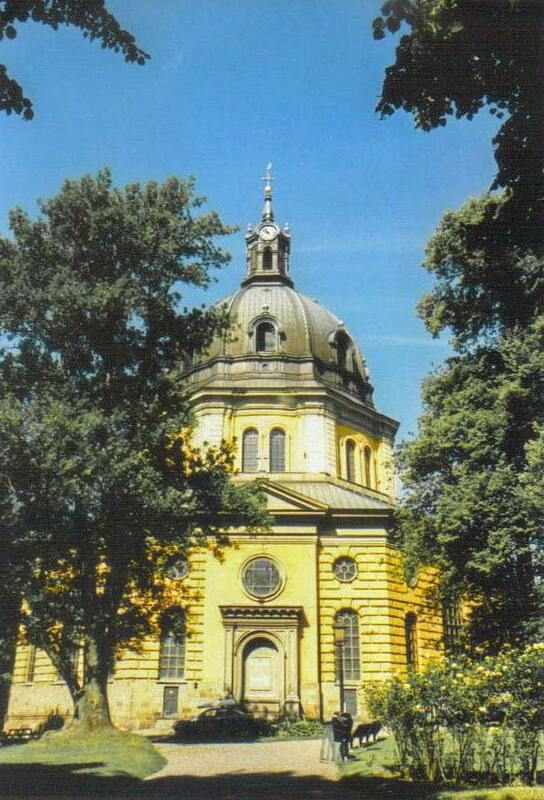 The church, consecrated in 1737, is named after the mid-17th-century Swedish Queen Hedvig Eleonora, wife of King Charles X. Plenty of round and arched windows allow abundant light to pour into the open, airy interior, with a few side chapels lit by elaborate chandeliers. The unusual colors of the eight columns morph from teal at the bottom into burgundy at the top. A pulpit with seemingly no access and a fine Crucifixion painting behind the altar add further unique aspects. Two sections of about 20 pews all fit under the massive dome. If you’re lucky, someone will be playing the gilded organ above you, bringing you back to a time when religion in Sweden mattered.